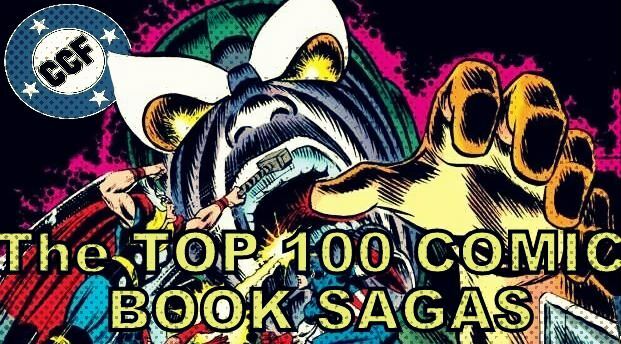 Back in August, we invited you to weigh in on your favorite comic book sagas of all time so that we could construct a definitive CCF Top 100 Comic Sagas list, reflecting the diverse and well-rounded tastes of this community. I hoped to get the results to you within a couple of days, but then life happened and, well, seven long months passed. One move, one divorce, two hard drive crashes, and two full re-tallyings of the data later, we finally have the results. I will be posting ten entries at a time, approximately whenever I have time to. I want to thank everyone who participated, and especially everyone who has been exceedingly patient waiting for these results. The bottom of the list is inevitably the messiest, with a massive amount of nominees that got in on a single vote, resulting in an absurd number of ties. We'll see these sorts of issues dwindle as we move higher on the list. I am pleased with how many honorable mentions made the list, and several will be surfacing higher up as well. If anyone would like to provide a write-up for any of the three honorable mentions that made this section of the list, shoot me a pm and I will edit them in. mrp says, "The third Valerian and Laureline story (though listed as Vol. 2 because the first volume was Vol. 0 and not available in English translation until recently). I’ve only read the first three Valerian and Laureline stories (Vol. 0 Bad Dreams, Vol. 1 The City of Shifting Waters/Earth in Flames and Vol. 2 The Empire of a Thousand Planets), but this is where it feels like the strip hits its stride. Valerian and Laureline are sent on a mission to infiltrate a galactic empire that has had no previous contact with Earth to determine their intentions and potential threat or role as ally to Earth. High adventure ensues as Valerian and Laureline have tech the empire doesn’t and they get embroiled in a revolution against the rulers of the Empire and the power behind the throne, the Enlightened. This is the adventure most point to, to find the visual influences on the look of Star Wars, but that is not the thing of interest in this story. Meziers art is spectacular, especially the sci-fi elements. His figure work is a bit cartoony, with the heads slightly oversized and out of scale, but his storytelling ability and visual settings are magnificent. And Christin takes you on a roller coaster ride of sheer fun and delight, with lots of twists, turns, action sequences and comedic hijinks mixed in. " rberman says, "Secret Wars made superheroes go BOOM! to mediocre effect. Crisis on infinite Earths made whole universes go BOOM! to confusing effect. Watchmen suggested that maybe letting our world go BOOM! is the only way forward. But for simple comic book action fun, this series outshines all three, as the world’s meanest supervillains unite first for a series of inexplicably philanthropic gestures, followed by an organized strike against the World’s Finest heroes. Aquaman of all people emerges as the series focal point, making a case for him far beyond talking to fish. Alex Ross’ art is in its usual fine form, showing every wrinkle on the brow of our beleaguered heroes, and every tooth in many a villainous smirk. Nobody has time to sit around and discuss the meaning of the universe here, but it’s still twelve issues of good popcorn fun with strong, heroic characterizations. Pull out your Super Powers action figures, and play along! BAM! PYOWWWW…." sunofdarkchild says, "What if Superman never came to be? That is the question posed by this thoughtful DC Elseworlds tale. Other heroes still come into being and function, but without the moral center Superman provides they are mistrusted and easily manipulated by men like Lex Luthor. Some of them fall into despair after suffering terrible losses, like Green Arrow. Unlike other Elseworlds which depict the world as a distopia (such as Act of God), I never felt that characters were behaving out of character. I do find it interesting that Batman dismisses all of the politics surrounding superheroes in this tale when he is very involved in other storylines, such as the Cadmus arc in the JLU cartoon, but this is also consistent with the Frank Miller 'we've always been criminals' Batman. Without Superman to inspire him as well, even Batman turns out even darker. This is what I want out of a 'what if,' an examination of what would happen if one thing were changed that builds on that one conceit." Arthur Gordon Scratch says, "This comic isn't especially groundbreaking, but it tells an epic, and a very pleasant to read through one. It is kind of like the movies you've already seen plenty, but every time you stumble upon those by chance on TV or something, you keep watching till the end, like Raiders of the Lost Ark, or Aliens. The art is nothing spectacular, but very effective, and taken in the grand scheme of things within the Grendel world, it reads as a stand alone very easily, but it makes you wonder what happened before and maybe even after, even if it has a great conclusion. It's greatest narrative quality is exposition, how it throughs you into a complex world, leting you feel that lots have already happened, even if you won't be aware of the details. In my book Matt Wagner at his finest. Here's the Dark Horse comics pitch for it : Grendel is one of comics' most provocative characters. From the beginning, Matt Wagner's stories have won critical and popular acclaim. This long-awaited continuation of the storyline picks up several years after the events of Grendel #40 and the death of Orion Assante. Ten-year-old Jupiter Niklos Assante, heir to the throne of the Grendel-Khan, is kidnapped from the retreat in which his rapacious stepmother has hidden him, away from his rightful power. The child is worth a hefty ransom, but there seems to be more than money on the mind of his kidnapper -- who is none other than Grendel!" 100 (tie). Gardner Fox's "Crisis"
thwhtguardian says, "Starting with his story in Flash #123 (The Flash of Two Worlds) Gardner Fox brought to the world of DC comics the idea of multiple worlds existing together in order to both explain previous continuities and bring those past iterations of characters to the present. It proved to be such a well received idea that starting in 1963 the crossover with the Justice Society would become a yearly event under Fox and remains a key part of DC's mythology to this day. As a kid these were some of my favorite issues in my father's collection, I loved the idea of other world's parallel to our own and the introduction to other heroes that existed before the ones I was familiar with was exciting. Other writers on down the years tried to capture that same feeling(with Gerry Conway and Len Wein coming the closest) but Fox truly did it the best." shaxper says, "A reluctant, pacifist philosopher king is thrust into a sequence of events where he must make a pact with the devil and finds that all of his good intentions ultimately lead to his reluctantly becoming the most terrifying and tragic villain his world has ever seen. Somehow, he also manages to be tremendously endearing in spite of (or, perhaps, because of) this. The characterization is vibrant, the art is stunning, the sweeping epic and mythological nature of the series is unforgettable, and the intensely vivid tones and emotional resonance throughout – this saga just floors me. I don't know how to say it better than that. Moorcock did it first; Thomas and Russell made it work on the comic page and made it more compact, beautiful, and evocative in the process. The two went on to adapt all the remaining Elric stories independent of one another, but it never worked quite as well as when they partnered together on these initial adaptations. *Note: The graphic novel from First Comics is a heavily revised and vastly superior version of the story originally printed in Elric of Melniboné #1-6 (Pacific Comics, 1983)." Michael James says, "Take superheroes, mix them into real life events in USA 1960's history. And you have this series. It is a glimpse into USA during the 1960's as a decade of changes. Another take on "what if super heroes were real"? And I thought Ridley did a great job interweaving different personalities, different viewpoints, several different subplots. The amazing thing to me as a child of the 60's it felt authentic. The Cold War. The Space Race. Civil Rights. The Kennedys. Changing social values. Jeanty & Story brought the action (as well as the talking heads sequences) to life. I like the suits & fashions of the decade. Yes there were other stories that were in the same vein as "what if superheroes were real". And there were also other stories that mixed heroes into real life events. But the reason this series gets re-read by me...is it felt authentic. And Ridley presented differing viewpoints well without preaching. His characters were nuanced & could have been easily one dimensional & stereotyped. But he avoided clichés (most of the time). He also had some twists that I did not see coming. He also made me care about these unknown characters in just 8 issues. Jeanty was a perfect choice as artist. His art is detailed without looking cluttered. His backgrounds (cars, buildings) look real. His "normal" figures look...normal. Yet his superheroes are muscular & have a slightly cartoony look." 96 (tie). Solar: Man of the Atom: "Alpha & Omega"
Hondobrode writes, "This was the backup story and was collected as Solar Man of the Atom : Alpha & Omega with an all black cover with a nuclear symbol warning also in black. Haven’t re-read this in years, but I remember it being the origin of Solar and it being sort of similar to the Incredible Hulk’s with the radiation accident and all. One of the best origin stories I’ve ever read and done so perfectly. I’m sure it still holds up today. Of course there are similar nuclear / atomic characters, but Solar is the first I think of, probably partially due to this great story. BWS was such a powerful force in early Valiant and I think this story in particular. Solar is a man of science and maybe part of why is story resonates so is that the art in it's romantic style is graceful and poetic resulting in a unique approach to a bombastically tragic and powerful story." shaxper writes, "Stan and Jack's last word together on the Silver Silver before the two parted ways one last time and Stan finally surrendered the character, allowing him to be used by other writers. It was also one of the comic book world's first original graphic novels. Essentially, this is a non-continuity re-imagining of the Surfer's origin, very similar to the original in many respects, but highly different in others. It also works to reconcile the two different characterizations of the Surfer prior to this (Galactus' loyal herald who grows a conscience, and Galactus' unwilling servant who sacrificed himself to save his world). They do a nice job of this. There's little doubt that the Surfer was Lee's favorite character, and possibly Kirby's as well. It's therefore not hard to see why this final effort by the two, fully understanding they'd likely never return to work together again, surpasses any other output either creator ever generated, whether together or separately. Even more than the original Galactus Trilogy itself, this is their masterpiece." Thwhtguardian writes, "Long before he wrote his seminal book, "30 Days of Night" Steve Niles adapted one of the best vampire novels around; Mateson's 1954 classic "I Am Legend" and it's one of the greatest adaptations around. I nearly didn't add this because although it was put out by a comic publisher, done by people in the field and it was serialized it's almost more like an illustrated novel rather than a comic...but I decided it counted because it was just so well done. It can be a tad boring at times, as it chronicles Nevile's attempt to find a cure which often means blocks of text and little action but those blocks all come straight from the novel itself which creates a fantastic sense of fidelity to the source." 93. Avengers: The Old Order Changeth! 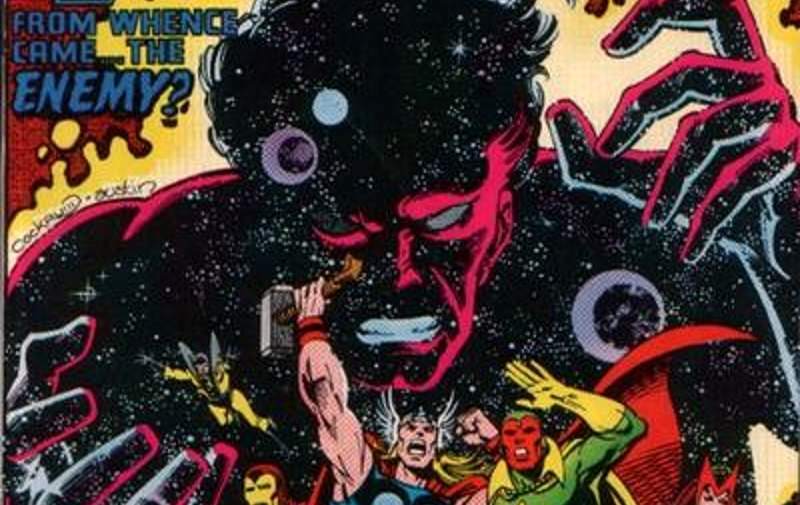 Icctrombone says, "This Avengers run is a perennial favorite of mine. Issue #16 has the Original Founders ( Iron Man, Thor, Giant-man, Wasp and Cap) Wrap up their fight with the Masters of Evil just to realize that they are burnt out and need a break. They immediately go about finding replacements when Hawkeye breaks into the mansion to “ audition” to join the team. That Audition happens to be him tying up Jarvis. Anyway, the word is put into the papers and Quicksilver and Wanda also join. There are nice scenes where the Submariner is also asked , but refuses. Maybe Cei-U! or some other Comic Historian will know for sure but, I believe this is the very first time in a Team Comic book that the line-up was almost totally turned over. It would be a template that is used many times afterwards for Teams in the big two. What follows in the next 9 issues is the best bickering, drama and heroics arguably seen in their entire run. And I loved it. This foursome is lacking in the raw power of their former members but make up for it by team work and courage. I love the way Cap’s leadership is challenged by all 3 newbies but they all come to respect him by the time The Wasp and Giant-man return in # 26." So glad to see this thread. I think all of us took it pretty seriously and a lot of thought went into it. I haven't read all of these but am seriously inclined to based on this. I know life got in the way Shaxper, and it was a lot of work, but am really glad that you were willing to put in the work with this. I had that same Spectre run at #3 on my list. Yes, you did. I'll make the change now, but we may need to take the list back to tabulation if we're finding an error this big this early on. Thanks for letting me know. No problems. Sorry to throw spanner in the works. Not at all. If we're finding an error this early in, it's safe to assume there are others as well. We needed to know this. I like what thwhtguardian said about Dracula. Coppola's is one of my favorite adaptations on film and Mignola's art is soooo good for horror stories. I guess this will finally seal the deal for me to pick the issues up. I've been kind of contemplating it already, as covers and scanned pages of it have been showing up in my pintrest feed lately. Seems like the powers that be want me to read this. You will not be disappointed. I'm not the biggest horror person but my wife and I both loved this movie when it came out and Topps did a bang up job with the adaptation. Oh, man, I totally missed out on this! I'm afraid slam's observation has led to a domino effect in which I've uncovered some significant errors with the tabulations. We're going to have to take this back to the drawing board and come back with a revised #100-91. Sorry, folks. The list is now revised. I am the snake in everyone's playground. Yes, yes. It's all Slam-Bradley's fault, everyone. I'm truly sorry that I'm unable to participate it and let's alone to do 100 of these ... it's an impossible task for me to do this and I've only know about 20-35 by heart and that's pretty much sums up this. You didn't have to submit 100. Almost all the points go to your top 10 selections anyway. Everything from 20 on down is just worth one point.